How and where do onlife consumers shop? Convenience: how much time and effort does it take when I want to buy something? You’d want routine buys to be nearly effortless, whereas complicated purchases can take a bit more effort. However, we can expect convenience to become more important in the future, for all kinds of buys. Choice: depth and width of product range or service selection is key. Customers want access to every possible thing, while still expecting retailers to help them make the right choice, and easily too. Webstores can easily use customer data to tailor their range to the individual shopper. Time saved and better shopping decisions all around. I also covered this basic need more in-depth in previous bookblog. 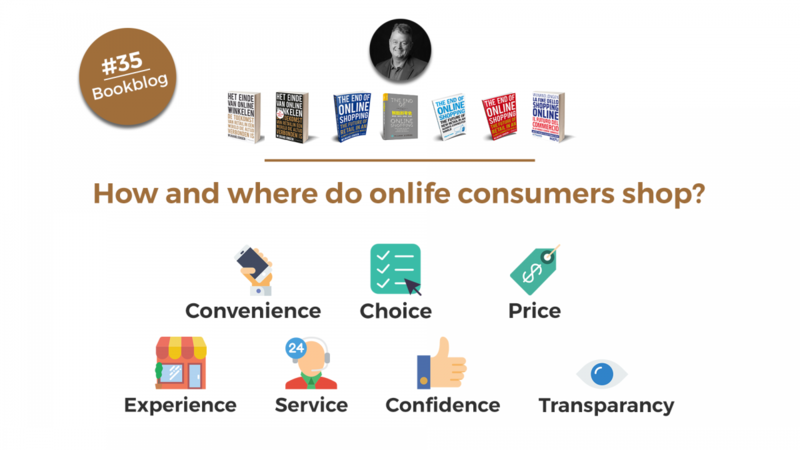 Price: the onlife consumer is no less – or more! – price-conscious than consumers used to be. In the overwhelming range of goods, presented in a new or non-traditional retail environment, the price can soon become more significant. Experience: the new essential in retail (though it has always mattered, to be sure). Atmosphere, experience and emotions are going to acquire new dimensions in the future, thanks to VR and AR. Service: this can be divided into two kinds, soft and hard, which are both going to become more important. ‘Soft’ equals attention, care, help, empathy and kindness; ‘hard’ translates into advice, installation, repair. Service flows naturally from experience, meaning that future onlife consumers want friendly and personal service AND efficient and timely service, too. Confidence: retailers who keep their promises – about the previous five shopping needs – are the ones to inspire confidence. Another aspect of confidence is that consumers are well aware of how valuable their personal data is, and by extension, they want to have confidence in the retailer they share it with. Transparency: the onlife consumer has high expectations of retailers being transparent about how their business is run. Every single step of the customer journey needs to be clear. Here, independent reviews can help the customer to decide before they buy. The bottom line is that businesses with an excellent record of meeting all these needs are the ones who will win over onlife consumers. Shopping platforms have great odds in doing so, though smaller (web) stores can be just as successful. Niche markets in particular are perfect for them, where being unique, personal, approachable and locally-sourced can surely be the deciding factor for the discerning onlife consumer. Customer knowledge: use what you know and make everything personal to me. Customer offer: only offer me relevant and accurate information. Customer experience: surprise me, seduce me, affect me, help me! Customer service: make it easy for me to decide. Because of the different types of shopper, retailers need to be savvy about which of these wishes is most important to what kind of shopper. For example, a passionate shopper loves experiences and being surprised by retailers. A more calculating shopper, on the other hand, places a higher value on easy-to-navigate customer service and free returns. Next week I will look at how shopping platforms aid the selection process and the new paradigm of choice. This is blog 35, based on my book ‘The end of online shopping. The future of retail in an always connected world’, published by Business Contact (Dutch/Flemish editions), Nubiz (English edition for UK and US, and Danish editions), WSCP Singapore (English edition for SE Asia), Post & Telecom Publishers Beijing (Chinese edition), Hoepli (Italian edition). The book will be published in Korean in December 2018 and is being translated in German, to be published in spring 2019. Additional translations are in preparation for 2019.